Which is the reason why I decided to switch to Easy Digital Downloads before the year ends and share with you how to do this. Till now, I used a combination of the Download Monitor plugin and Sellfy download button includes, included into my current theme. 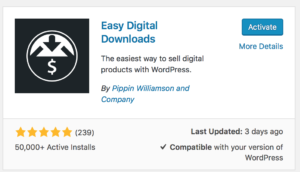 Now you have a nice “Downloads” Section in your WordPress Admin Sidebar. Let’s go to the settings first. First of all, you have to set your downloads pages, like the checkout page. 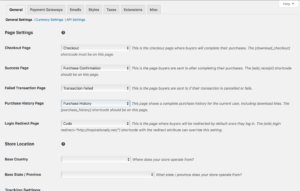 For pages (Checkout and its subpages, Purchase History and Transaction Failed) should have been created automatically, but you might want to have them at another place. In the Pages overview, you can edit them to have another parent or another name. You have to add the country you’re from as base country. You can also set the Login Redirect page. In my case, this is the Downloads overview called “code”. Do not forget to save the settings before going to the next tab or the changes will be gone. Next sub-tab, you can set your currency. In my case, it is Euro, not dollar. I ignored the API settings. Next tab is important, the Payment Gateway. 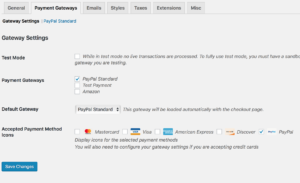 If you just want to accept Paypal, like me, check Paypal Standard from the checkboxes and the dropdown. In the next sub-tab, just enter your Paypal email and leave the other (API) fields free. You will need them only for sending refunds through WordPress, but you can do that through Paypal if it ever happens. You can also go through the “Misc” settings and customize it to your personal needs (like if users have to create an account to download). Under the “Extensions” tab, you can add the text for your free downloads links buttons if you have that plugin installed, too. Now I think it is time to add some downloads. We can go to Downloads -> Categories and set up some of them, like php scripts, WordPress plugins, WordPress themes. Then, go on to “Add new download”. Add your title, a description and the category. 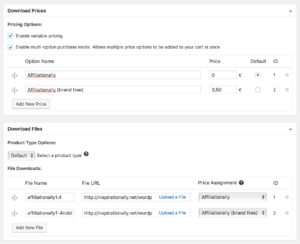 Now you can go to the pricing options. For Affiliationally (php script) there is a free version and the brand free paid version. See the attachments how I’ve done it! Now downloading your downloads will work, but it still looks…rather bad inside my personal site. Buyers might want to find their downloaded links later or get to the shopping cart if they went away from it. 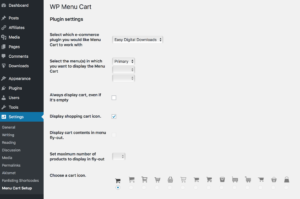 So I installed the plugin WP Menu Cart. There is not as many options in the free version, but you can change the look easily through the style.css in your theme folder. In my case, I had to use this css code to make it appear nice. You can overwrite the dash before the amount with adding !important to the code. Now I was still missing an option to see the purchase history. This means, that you have to be able to log in somewhere. I didn’t want a login box to appear everywhere on the site, because it is not just a shop, but also a personal website and a fanlisting collective. 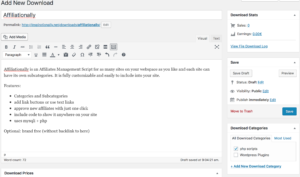 Another problem is that my theme does not have a sidebar at all. So I thought, somewhere on the code page, where you actually find the downloads, might be a nice place. So on my code page, I put up a link to the purchase history page. Here you can see the downloads you already purchased and re-downlaod them. [edd_is_user_logged_out]Please log in to view your purchase history and re-download them. Which means, if the user is logged out, it shows a login form, if the user is logged in and has purchases, the download and purchase history is shown. Hey, just letting you know that I’m alive! Sorry for hiatus, updates coming soon!